The pension and retirement income system in India has figured in the lowest category in the world, according to the Melbourne Mercer Global Pension Index 2018, published by Mercer, a human resources consulting firm, along with Australian Centre for Financial Studies and Monash University. The other countries in this category along with India are Japan, South Korea, China, Mexico and Argentina. According to the study, these countries have a system that has some desirable features, but also have major weaknesses or omissions that need to be addressed. Without improvements on these weaknesses, the efficacy and sustainability of these systems are in doubt. The index has categorised 34 countries’ pension systems based on their adequacy, sustainability and integrity. Adequacy index takes into account factors like tax support, savings and system design. Sustainability includes factors like pension coverage, contributions, government debt and economic growth. Integrity index is a measure of aspects like regulation, governance and costs. The top category with countries having a “robust retirement income system" includes only two countries, Netherlands and Denmark. These countries have a score of over 80 in the index, while the category which includes India has a score between 35 and 50. India scored 44.6 in 2018, which is marginally lower than its score at 44.9 in 2017. Netherlands and Denmark, which are at the top in the Mercer index, have defined contribution and defined benefit plans. Denmark’s retirement income system comprises a public basic pension scheme, a means-tested supplementary pension benefit, a fully funded defined contribution scheme and mandatory occupational schemes, according to the report. A means-tested scheme is where a person is given a certain benefit if she has income below a certain threshold. There are also other countries that score high in the index, though not in the top category, including Finland, Sweden and Canada. Canada’s retirement income system comprises a universal flat-rate pension, an earnings-related pension based on lifetime earnings, voluntary occupational pension schemes, and voluntary individual retirement savings plans. India’s pension system, which is largely limited to the organised sector, comprises the Employees’ Pension Scheme (EPS) run by the Employees’ Provident Fund Organisation and the National Pension System run by the Pension Fund Regulatory and Development Authority of India. For the unorganised sector, the Atal Pension Yojana (APY) has been gaining importance with about 1.1 crore registrations in the first 3 years of its introduction and about 4-5 lakh new members signing up every month. The Mercer study highlights that steps like introducing a minimum level of support for the poorest, aged individuals, increasing coverage of pension arrangements for the unorganised working class, improving the regulatory requirements for the private pension system and increasing the level of contributions in statutory pension schemes can lead to increase in the index value for India. Ritobrata Sarkar, head of retirement, India, Willis Towers Watson, said that while general savings rates in India are moderate, there is a lack of awareness around savings for retirement or pure pension products. This is particularly true for the unorganised sector, where people may not understand the importance of retirement adequacy and the financial implications of a longer post retirement life due to increasing life expectancy. “Within the organised sector, there is greater demand for investment products like mutual funds or unit-linked insurance plans which provide more flexibility of withdrawals. The lack of transparency on investment returns, charges around pension products as well as unavailability of innovative and meaningful annuity products, have also contributed to a low penetration of pension," he said. 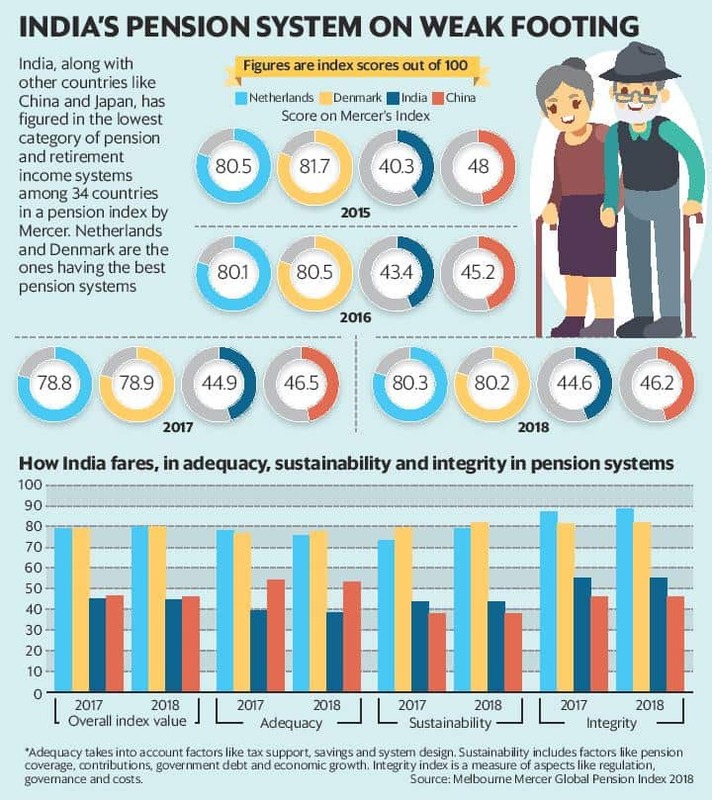 Moreover, with rising life expectancy contributing to an ever-increasing retired population, lack of a meaningful universal pension system continues to pose a major long-term challenge for India, he said.